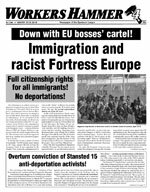 Overturn conviction of Stansted 15 anti-deportation activists! The conviction of the Stansted 15 — members of End Deportations and Lesbians and Gays Support the Migrants — on terrorism-related charges on 10 December is an outrage! These activists had chained themselves around a government-chartered jet at Stansted airport in March 2017 to prevent the deportation of some 60 people to Ghana and Nigeria. Due to that courageous action, eleven of those threatened with deportation were still in Britain over a year later pending appeals, and at least one of them was granted the right to remain. From the standpoint of the working class, the Stansted 15 are heroes not criminals. Reverse the convictions! The capitalist state is intent on using the case to intimidate anyone who would actively challenge the government’s draconian anti-immigrant policies. The protesters were originally charged with aggravated trespass, but the charges were increased to “disrupting the services of an aerodrome”. This offence — carrying a potential sentence of life imprisonment — was created by the Aviation and Maritime Security Act 1990, a law passed in the wake of the 1988 Lockerbie airliner bombing purportedly to prevent terrorist attacks. While Theresa May and her government are notorious for the “hostile environment” policy, the Labour Party when in office has been no less vicious in persecuting immigrants and refugees. It was the Blair Labour government that launched the use of chartered deportation flights, and Blair’s 2005 re-election campaign featured a rabid crusade against asylum-seekers. As for Jeremy Corbyn’s Labour, its 2017 election manifesto pledged to hire 500 more border guards. The bourgeoisie pushes anti-immigrant racism in order to divide the working class and holds up immigrants as scapegoats for the misery and austerity for which the British ruling class themselves are responsible. In order to build proletarian unity in the face of the capitalists’ divide-and-rule tactics, the trade union movement must fight for: No deportations! Full citizenship rights for all immigrants! As part of this struggle, it is necessary for the trade unions to rally behind the cause of the Stansted 15. Moreover, if the government gets away with wielding the Aviation and Maritime Security Act against the Stansted 15, it will also use it against aviation workers who “disrupt” an airport in the course of a strike. Far more effective in preventing deportations than isolated actions by handfuls of liberal activists would be for the social power of the aviation unions to be mobilised to stop deportation flights. The GMB, Unite and the BALPA pilots union represent many thousands of workers at airlines and airports across Britain. The Stansted 15 are scheduled to be sentenced in February. They have won broad support in the fight to overturn their convictions; a solidarity protest, which we encourage our readers to attend, will be held outside Chelmsford Crown Court on the morning of 4 February. The Partisan Defence Committee, the legal and social defence organisation associated with the Spartacist League, has made a donation to the fund for the Stansted 15’s trial-related costs and has written to the Crown Prosecution Service protesting the conviction. Protest letters should be sent to: Judith Reed, Deputy Chief Crown Prosecutor, East of England Complex Case Unit, CPS, County House, 100 New London Road, Chelmsford, Essex CM2 0RG. Email: eastofengland.inbox@cps.gov.uk. Donations can be made at chuffed.org/project/end-deportations-charter-flight-action-trial-related-costs. Down with EU bosses cartel! Cops, prison guards out of the unions! Down with chauvinist National Remembrance law!